Confirmed keynote speakers include: Robert Neimeyer, Mick Cooper, Kirk Schneider, Harold Koenig, William Breitbart, Clara Hill, Alex Pattakos, Itai Ivtzan, Alexander Batthyány, and Paul T. P. Wong. Delta Toronto East Hotel (2035 Kennedy Rd, Scarborough, ON). The answer to meeting society’s increasing mental health needs is not more diagnoses, more pills, and more psychiatrists, but applying nature’s way to manage symptoms and increase well-being, according to Dr. Paul T. P. Wong, a renowned Toronto psychologist. Dr. Wong will present a radical approach to treating mental disorders and enhancing community mental health at the INPM Summer Institute, held at the Delta Toronto East Hotel, August 16-18, 2013. His approach is internationally known as Meaning Therapy. Positive2012 is a conference not to be missed. A unique conference, starting with optional pre-conference workshops looking over Circular Quay near Sydney Harbour, followed by an opportunity to participate in the Good Mood Safari in Wollongong, the most novel positive psychology outdoor tourist experience you will ever experience. Or for later starters you can attend the free Emerging Researchers Symposium at the Wollongong site of the Sydney Business School. On Friday evening the conference officially opens looking over the beautiful North Wollongong beach from Novotel Northbeach. Saturday’s proceedings will combine the best set of speakers on positive psychology and wellbeing ever assembled in Australia in one place across four “beams” to help us spotlight the future of positive psychology and wellbeing. Dr Paul Wong will be presenting a workshop at Positive 2012 on Meaning-Centered Counselling and Therapy (MCCT). The meaning-centered approach is integrative, holistic, existential and evidence-based with a focus on the positive psychology of meaning and spirituality. It invites people on a personal journey of healing and transformation, and provides the strategies and skills to cope with personal predicament and live a purposeful and worthy life. By participating in this intensive workshop, you will learn the basic theory and practice of MCCT in addressing various clinical issues, such as depression, grieving, PTSD, and addiction. You will learn the necessary tools to restore hope and meaning for those in the depth of brokenness and despair. 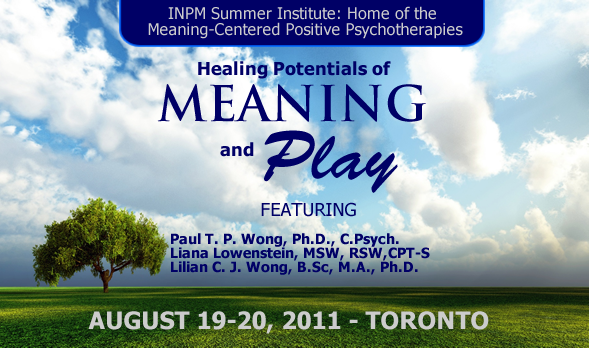 The International Network on Personal Meaning (INPM) is pleased to announce the 7th Biennial International Meaning Conference to be held July 26-29, 2012 in Toronto, Canada. The main conference theme is: A Positive Global Vision of Healing and Flourishing through Meaning. In today’s climate of global economic uncertainty, geopolitical conflicts, ecological crisis, and the widening gap between haves and have-nots, the meaning perspective offers a promising vision to resolve these challenging global issues and achieve sustainable growth for both individuals and society. The conference will highlight the role of meaning in well-being, flourishing, character strengths, resilience, post-traumatic growth, spirituality, psychotherapy, healing, recovery, and positive organizations. It will emphasize both cutting edge research and the application of research findings to meaningful living.